Tom Wopat and Will Chase have joined the previously announced Laura Osnes in the New York City Center Encores! production of Rodgers and Hammerstein’s Pipe Dream, running March 28 - April 1. Pipe Dream will be directed by Marc Bruni with music direction by Rob Berman and choreography by Kelli Barclay, and will play for seven performances at New York City Center, West 55th Street between 6th and 7th Avenues. In addition to Tom Wopat, Will Chase and Laura Osnes, the Pipe Dream cast (as of February 8) includes James Clow, James Moye, Steve Routman and Stephen Wallem. Outcasts living by their wits populate the bordellos and flophouses of a 1950s California seaside town in Rodgers and Hammerstein’s Pipe Dream, based on John Steinbeck's novel Sweet Thursday.The show features many of Steinbeck’s Cannery Row characters and tells the story of the romance between Doc (Will Chase), a marine biologist, and Suzy (Laura Osnes), a young woman who hitchhikes into town looking for a better life. Doc’s friends include Mac (Tom Wopat), Hazel (Stephen Wallem), and Fauna, the owner of the local brothel. Pipe Dream opened at the Shubert Theatre on November 30, 1955, and ran for 246 performances. It was nominated for nine Tony Awards, including Best Musical. The 2012 Encores! season is made possible, in part, by the Stephanie and Fred Shuman Fund for Encores!, Stacey and Eric Mindich, and Daryl and Steven Roth. In addition, Encores! is supported by Newman’s Own Foundation. Paul Newman was committed to helping make the world a better place. To carry on his philanthropic legacy, Newman’s Own Foundation donates to charity all net royalties and profits after taxes from the sale of Newman’s Own products. To date, Paul Newman and Newman’s Own Foundation have given over $300 million to thousands of charities around the world. For more information, visit www.newmansownfoundation.org. Will Chase (Doc) currently stars as Michael Swift on the new NBC hit "SMASH". Chase, originally from Frankfort, Kentucky, started singing at a young age and went on to study percussion and conducting at the prestigious Oberlin Conservatory of Music. Following school and regional theatre in Chicago, Will made his Broadway debut as Roger in the critically acclaimed show, Rent. He went on to star in many Broadway productions including Billy Elliot, Miss Saigon, The Full Monty, High Fidelity, The Story of My Life, Aida and Lennon. Memorable television appearances include Pat Mahoney on "Rescue Me", "Royal Pains", "Pan Am", "White Collar" and "Law & Order Criminal Intent". He starred in last season’s Encores! production of Bells Are Ringing. Tom Wopat (Mac) Broadway: Catch Me if You Can (Drama Desk Nom. ), Sondheim on Sondheim, A Catered Affair (Tony, Drama Desk, Drama League nominations), Glengarry Glen Ross (Tony and Drama Desk Awards for Best Revival), Chicago, 42nd Street, Annie Get Your Gun (Tony, Drama Desk nominations), Guys and Dolls, City of Angels, I Love My Wife. Off-Broadway: Olympus On My Mind, The Guys, Last of the Boys. Television: "The Dukes of Hazzard," "Cybill," "Home Improvement," "Taking Chance" (HBO). Film: Bonneville, Jonah Hex, Main Street. Jazz Standard Albums: The Still of The Night, Dissertation on the State of Bliss, Consider It Swung. Owns the family farm in Wisconsin. Laura Osnes (Suzy) returned to Broadway this fall as Bonnie Parker in Bonnie and Clyde after originating the role at Asolo Repertory Theatre and La Jolla Playhouse (San Diego Theatre Critics Circle Award, Outstanding Lead Female Performance in a Musical). Before that, Osnes starred as Hope Harcourt in the Tony-winning revival of Anything Goes (Drama Desk, Outer Critics Circle and Astaire Award nominations) and as Nellie Forbush in Lincoln Center Theater’s production of South Pacific. She made her Broadway debut as Sandy in the most recent revival of Grease, having won the role on NBC's reality competition "Grease: You're The One That I Want." Her many regional credits include Kim McAfee in Broadway: Three Generations (Kennedy Center). James Clow (Ray) appeared on Broadway in Assassins, Blood Brothers, Company, She Loves Me, Wonderful Town, and Irving Berlin's White Christmas. He last appeared at City Center in the Encores! production of A Tree Grows in Brooklyn. James Moye (Jim) has appeared on and off-Broadway in Million Dollar Quartet, Ragtime, A Tale of Two Cities, The Full Monty, Urinetown and Happiness (Lincoln Center). His national tours include The Drowsy Chaperone, Little Shop of Horrors, and Irving Berlin's White Christmas. Steve Routman (George) has appeared on and off-Broadway in La Bête, The Shaggs, The Fantasticks, Shmulnik’s Waltz, and Lingoland. Stephen Wallem (Hazel) is best known as Thor on the Showtime series “Nurse Jackie”. National tours include Forever Plaid, Into the Woods, and Scrooge. He accrued nearly 2500 performances as both Jinxand Sparky in various companies of Forever Plaid including Chicago, Las Vegas, and the first national tour. Stephen portrayed Judas/Padre in Court Theatre's Man of La Mancha and reprised his performance at Long Wharf Theatre in New Haven. He appeared at the Ravinia Festival with Patti LuPone, Audra McDonald, Michael Cerveris and George Hearn in A Little Night Music, Passion, and Sunday in the Park with George. Marc Bruni (Director) has directed Ordinary Days (Roundabout), Such Good Friends (NYMF Directing Award), The Sound of Music, The Music Man, My One and Only, Seven Brides... (all for St. Louis Muny), The 25th Annual Putnam County Spelling Bee (Paper Mill/PTC), High Spirits (York Theater), and Glimpses of the Moon (Oak Room). He was associate director of the Broadway, London and touring productions of Legally Blonde and appeared on MTV's “Search for Elle Woods.” He has been associated with Walter Bobbie, Kathleen Marshall, Jerry Mitchell and Jerry Zaks on 14 Broadway shows including Anything Goes, Irving Berlin's White Christmas, The Pajama Game, Grease, Wonderful Town, High Fidelity, Sweet Charity, La Cage Aux Folles, and Little Shop of Horrors (Bway/Tour), as well as on City Center Encores! productions of Finian's Rainbow; No, No, Nanette; Applause; 70, Girls, 70; and Bye Bye Birdie. He directed the Encores! production of Fanny. Rob Berman (Music Director) is in his fifth season as music director of Encores!, where he has conducted Merrily We Roll Along, Where’s Charley?, Lost in the Stars, Bells Are Ringing, Anyone Can Whistle, Fanny, Finian's Rainbow, Music in the Air, Damn Yankees, Applause and Stairway to Paradise, as well as several gala concerts. 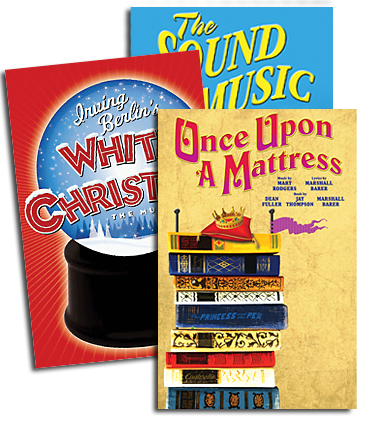 Broadway conducting credits include Finian's Rainbow, Irving Berlin’s White Christmas, The Pajama Game, The Apple Tree, Wonderful Town and Promises, Promises, among others. He is a three-time Emmy nominee for his work as music director of the Kennedy Center Honors and a winner of the Helen Hayes Award for Best Musical Direction for his work on the Kennedy Center’s production of Sunday in the Park with George. He was also music director for A Broadway Celebration: In Performance at the White House. Kelli Barclay (Choreographer) was associate choreographer on the Broadway productions of 42nd Street (revival), Irving Berlin's White Christmas, State Fair and Ain't Broadway Grand, as well as the Encores! productions of Do, Re, Me; Face the Music; Of Thee I Sing; and No, No Nanette. Her additional New York credits include Camelot in Concert starring Jeremy Irons (Shubert Theater), Hurricane the Musical (NYMTF), and My History of Marriage. New York City Center (Arlene Shuler, President & CEO) has played a defining role in the cultural life of the city for nearly 70 years. It was Manhattan’s first performing arts center, dedicated by Mayor Fiorello LaGuardia in 1943 with a mission to make the best in music, theater and dance accessible to all audiences. Today, City Center is home to many distinguished companies, including Alvin Ailey American Dance Theater and Manhattan Theatre Club; a roster of renowned national and international visiting artists; and its own critically acclaimed and popular programs. The Tony-honored Encores! musical theater series has been hailed as “one of the very best reasons to be alive in New York.” Dance has been integral to the theater’s mission from the start, and dance programs, including the annual Fall for Dance Festival and a partnership with London’s Sadler’s Wells Theatre, remain central to City Center’s identity. City Center is dedicated to providing educational opportunities to New York City students and teachers with programs such as Encores! In Schools and the Young People’s Dance Series. Special workshops cater to families, seniors and other groups, while events such as the Fall for Dance DanceTalk series offer learning opportunities to the general public. Last year, City Center completed an extensive renovation project to revitalize and modernize its historic theater. City Center is located on West 55th Street between 6th and 7th Avenues. 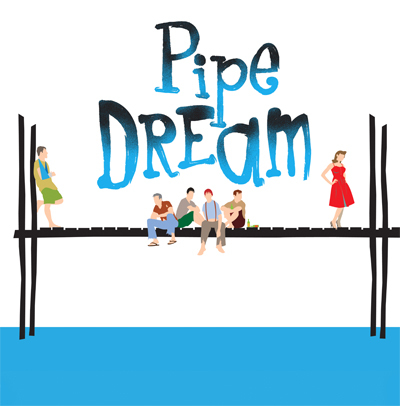 Pipe Dream will run for seven performances, March 28 – April 1, according to the following schedule: Wednesday at 7:30 p.m., Thursday and Friday at 8 p.m., Saturday at 2 p.m. and 8 p.m., and Sunday at 2 p.m. and 7 p.m.Tickets start at $25 and can be purchased at the New York City Center Box Office (West 55th Street between 6th and 7th Avenues), through CityTix® at 212-581-1212, or online at www.NYCityCenter.org.